We each play a role in the conflict in Africa because our demand for electronic resources is what fuels it and guns from our country perpetuate it. Therefore, we should each play a role in peace. John Prendergast discussed the need for a mass movement of people in the United States who want to stop genocide. It is up to us to put political pressure on Congress and the president to act. We must use our political voice. When we raise our voices in unison, it makes a difference. 1) Join the anti-genocide movement. 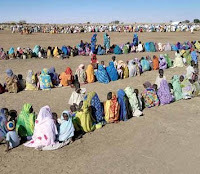 Sign up for an organization like Save Darfur, STAND, or Enough. These organizations lobby members of Congress, and have power simply because they have a large number of people behind them. It is free and easy, and even if you don't read the emails they send you, you are helping just by being on the list. 2) Call Congress and/or the White House directly. They tally up the number of calls they receive. There is even a special phone number for this issue: 1-800-GENOCIDE. You can call as many times as you want. 4) Get in touch with members of Congress. For California Senators: Click here to email Barbara Boxer. Click here to email Dianne Feinstein. Click here to get information on how you can write to your representative in the House. According to John, if you don’t vote or write to the people you vote for, you don’t really exist in the system. We elect them and are their bosses, so they listen to us. 5) Write to your local media or call them. 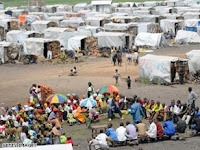 Tell them that you want to see more news about what is going on in war-torn places like Africa. We are their bosses also, because we buy their newspaper. The biggest changes have come about because of large-scale people’s movements. Think about the abolitionists, the women’s movement, the civil rights movement, the anti-apartheid movement, and others. Now is time for an anti-genocide movement. This may be the most compelling moral issue of our time, according to John. We must raise our voices to stop the first genocide of the 21st century. This is our chance to prevent the deaths of millions of people. i admire you so much for what you write about & what you are concerned for (who you are concerned for more importantly) your passion is so contageous and i know you have already stirred something in my own heart. thank you for sharing so much of yourself with us on thanksgiving. (you definitely challenged me) i enjoyed every minute of it & walked away wishing the night hadnt ended. lets sit around travis's living room again soon.